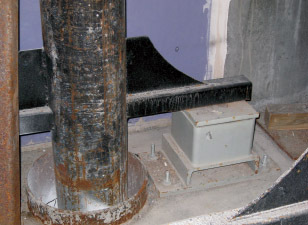 Vertical Pipe Riser Isolation Guides and Anchors. ISAT and Kinetics vertical pipe riser isolation guides and anchors. There is NONE BETTER for Engineering services, manufacturing and testing capabilities - all backed by the industry’s most experienced staff. Model KRG riser guide and isolator provides flexible support for a pipe riser by allowing it to expand and contract vertically while limiting its movement horizontally. 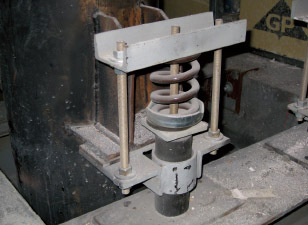 The KRG is available with or without spring isolation. The deflection offered is 1”, 2” and 4”. The capacity range is from 35 lbs. to 23,000lbs. Model KPA pipe anchors are used to secure the position of a vertical or horizontal riser. The anchors are selected based on the amount of force the pipe will transfer into the structure a specific point of attachment. Anchor capacities range from 500 lbs. to 40,000 lbs. and must be used in pairs.